Hot on the heels of the end of National Home Security Month, West Yorkshire Police has released its autumn/winter anti-burglary campaign. 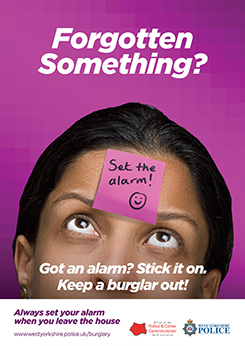 This time the message is about remembering simple things that can make all the difference between getting burgled or not. 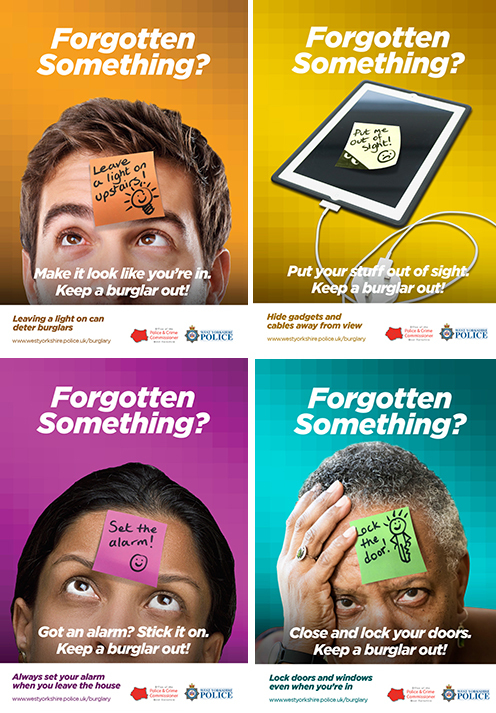 In the campaign posters, people write simple prompts on sticky notes – the kind of little notes you write to remind yourself to do something – and then stick them to their foreheads, with the title ‘Forgotten Something?’. They are to remind people to lock their doors, set their alarm, put their valuables out of sight and leave a light on. All really simple tasks that can easily be forgotten – to your peril! They have also created some fun videos with primary school children posing as police officers. This one is our favourite! The underlying message is that home security is really all about adopting good habits that strengthen your home’s protection against burglars. As you’re more likely to be burgled on bonfire night than any other night of the year, now is a good time to start!